SNAFU! : US forming a Cruise Missile Strike Group off Syria? 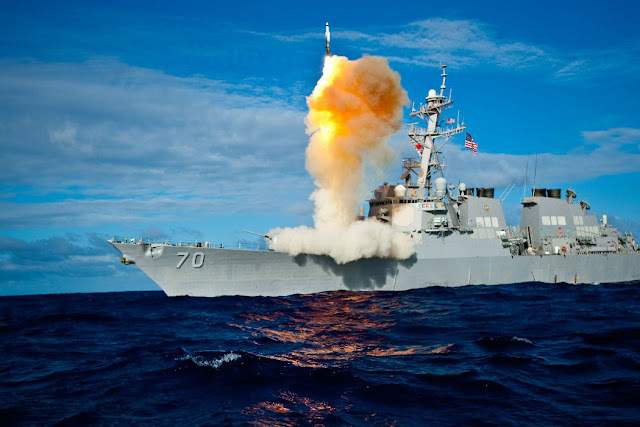 US forming a Cruise Missile Strike Group off Syria? Thanks to DavidJames for the link! The Russians have been sounding the alarm about this coming and to be honest I discounted it. Trump isn't a believer in endless war and I don't believe he's a supporter of our policy in Syria which is obviously aimed at removing Assad---NOT KILLING ISIS! Having said that its also obvious that the deep state, Main Stream Media-Republican Never Trumpers'-Establishment Govt-Democrats of every stripe, are working on a psy ops campaign on this dude. Anyone with even a bit of common sense would be able to piece it together. The constant drumbeat about Trump despite everything else happening in society and govt? Yeah they've done an analysis on the guy and determined that a steady drumbeat of bad news coupled with guided direction when it comes to foreign affairs via "his generals" (wolves in sheeps clothing...they have labored long to lose two wars (Afghanistan/Iraq), start a third (Syria), participate in a fourth(Yemen) and we're no closer to winning?) and suddenly that strike in Syria becomes more likely. Trump is a victim of his own hubris. A more calm individual would stop tweeting, get his head down and work on his agenda. Not the Republican agenda but his own populace agenda. Another strike on Syria ain't his agenda.